It was my father’s 80th birthday and I wanted to make a cake that was something he loved, so we thought about it for awhile and he loves garlic, he puts it in everything he makes from eggs to soup to pasta, you name it, garlic is in it, so I decided to make a garlic bulb. I made a bundt shaped cake and then used a cupcake to fill the middle. 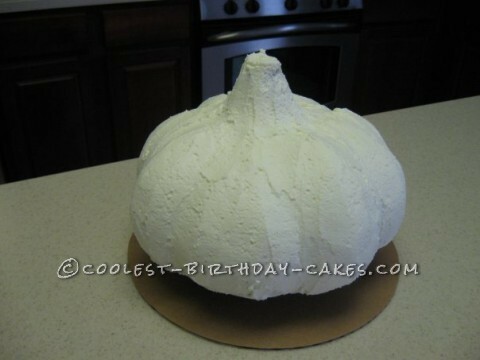 I carved out the “bulb” a little and then iced it with of course, vanilla butter cream. I don’t like the taste of fondant that’s why I went with butter cream and I think the butter cream actually looked more like the paper of a garlic bulb that the fondant would have. My father could not believe it when we brought it in singing happy birthday. I had to get copies of the picture of the cake because he wanted to send a picture to some of his friends and he had to have a few to show off to people. I was really pleased with the results.